Focus: To understand why the pricing of your online personal training packages should suit your chosen online business model for success. Face to face personal training and online personal training are different animals. 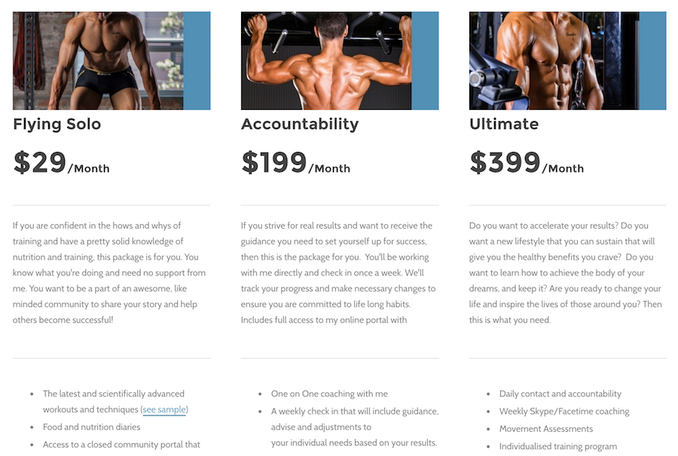 In this execution plan we talk about the differences between the two and how to create online personal training packages that sell. ​You'll learn what the best models for online personal training are, the model you should avoid and follow a real life case study with step by step instructions to creating your own online training packages! ​To understand how to best package our services, we need to understand the basics of pricing models, how they work and why they work. 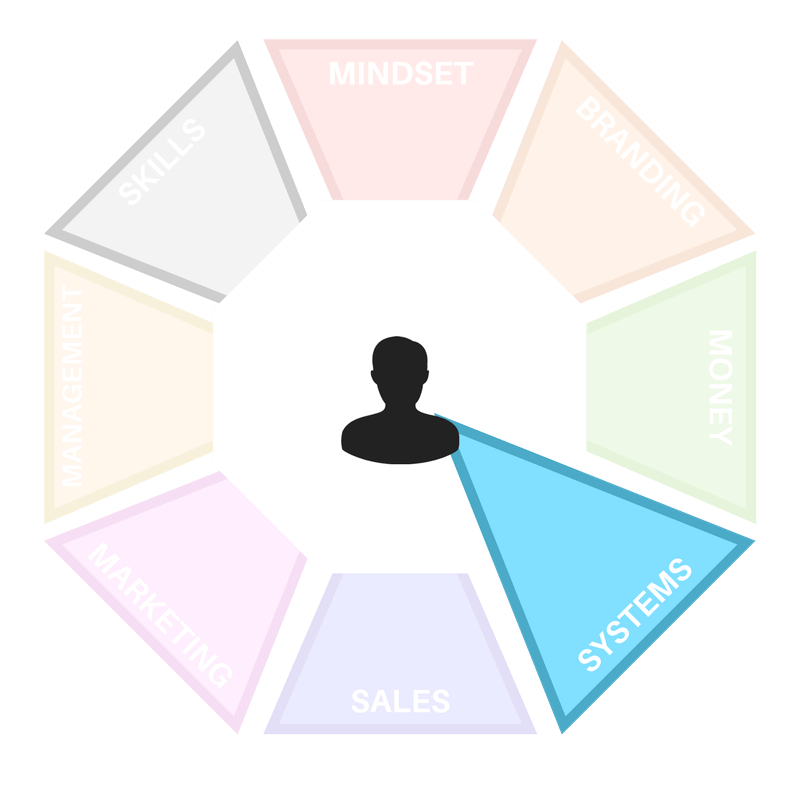 Just a cut above a “sample” version of a product, this model relies on the customer wanting more features and voluntarily upgrading to the “Business” or “Professional” version of your product/service. Works well with software or online services like a member portal. Coincidentally, the iPT membership also uses the limited functionality with upgrade model. True tiered pricing is actually volume-based. “Order two, get one free” is one example. “Three sessions for £80 or £90 separately” is another. If you were to turn this pricing model into a graphic representation, it would almost look like an inverted pyramid. Tiered pricing works best with physical goods combined with multiple buyer types. For example, a low end membership, a premium membership and a VIP membership. Each offering is suitable for different budgets. This strategy got its name from Gillette, the razor company that first came up with the idea of selling the shaver for almost nothing and making money off the replacement blades. Online companies such as Skype use this model, where they provide the free software and service, but you pay constantly for credits and other extras. And the most notorious example comes from the computer peripheries industry, where replacement ink cartridges almost equal the cost of the printer (e.g. the Canon Pixma ip2700 printer at $49.99. Cost of replacement cartridges at Staples? $28.99 for the black ink cartridge alone and an additional $35.99 for color – that would be $64.98, should you wish to purchase color and black cartridges separately. And at $57.75 for a combo pack, it still works out to more than replacing the printer with a new one, which does arrive with ink cartridges included. Yup, folks. Razor-and-blade pricing at its finest! Most personal trainers are only too familiar with this model: Offer a free session/product that is perceived as valuable to the target customer or client, and be presented with upsells and “OTO” (one- time-only) special offers. Typically, if the freebie product is a digital information product, it tells readers valuable details about what to do, throwing out enough “how to” to prove the vendor is the person who knows the secret... but only hints at how to actually do it. The upsells provide the “how to”. The OTO provides added value (and sometimes status-boosting elitism). A typical example would be a niche or topic-based Facebook Group, where the owner can use the ground-floor freebie level to pick up ideas, as well as establish oneself as a niche expert. The proven idea is that die-hard fanatics in that niche (the ones who eagerly buy) will not only want more exclusive privileges through a “Gold” or “Platinum” level, but also crave the status of becoming authority figures in that niche too. This works well for the forum or membership site owner at higher levels, because these members often answer a lot of the “newbie” questions at lower levels – and take a fair burden of work off the owner. Works well with online information products and systems. You can price more than your competitors if you offer higher-value – especially if that includes a unique service or feature your competitors haven’t been able to provide. For example, perhaps you include installation with your software package, while similar software sellers don’t. Or perhaps you include custom, original graphics with your ghostwritten blog posts, and competing ghostwriters don’t. Works well with service-based businesses, as well as almost every other types. This model is often adopted by service providers – especially in today’s economic climate where struggling clients badly need fixed prices in order to stay competitive and make a profit. Clients know exactly what they’re going to pay, regardless of the amount of work a program takes, so they can accurately budget their outsourcing fees (i.e. your pay). An example would be someone who charges £500 for fitness package, or a nutritionist who charges £1000 for a lifestyle overhaul. This is the industry standard for most personal trainers, though many trainers do combine it with the “flat fee” model, lumping services that are easy – or that junior staff members can do – into packages. This last factor should literally be the last one you take into consideration. Research and look at prices across the board for your industry, average them out as a starting point. Then adjust this rate based on the first five factors in the previous list. There are 2 main business models you can use when creating packages for your online training. With variations inside each of them. ​Lets explore the difference between the two, which one is likely to be right for you (if either) and the pros and cons of each. The low-end membership model is more of a mass-market offering that depends on numbers. A low end membership is usually positioned behind a pay wall on your website. A client would log in to your membership area and deal mostly with you or a member of your team. Even though time is a limiting factor, it’s still something you need to take in to account when you’re pricing your services. Figure out how much time each client will take up and then charge accordingly. High end coaching often appears in two main formats. Bespoke one-on-one coaching and high end group coaching. With bespoke 1-1 training, you’re going to be investing a lot of time and energy into someone with your expert knowledge of their problems. This means you can charge accordingly. And pricing for this type of coaching is completely up to you. My advice is to have clients pay for 6-12 weeks of coaching up front. To make real changes, you need a big commitment. High end group coaching is a little different. It’s a bit less intimate than one-on-one coaching, which means you can often charge a bit less. But the whole premise of this type of training is to bring a small group of like minded individuals together, all with one goal in mind. Packages for high end group coaching should also be fixed length and based on how well you think you can solve their problems. More often than not, you don’t need a comprehensive service pages on your website for high end coaching. It relies on referrals or excellent marketing skills to generate income. High end coaching packages are almost always 100% bespoke. That means you don't need a list of features or benefits, you need to spend time on acquiring social proof that proves you can do what you do and reputation. Because you'll be charging a lot for your services. Despite the vast differences in price point between the high end coaching and low end membership packages, there's a pretty simple formula you can use to create low end online personal training packages that actually sell. Start with your list of features. Features don't sell, but we need a list of features so we can more easily create a list of benefits. Benefits sell. For example, a feature might include weekly Skype coaching. Your client knows that a Skype call will help to make them accountable so the benefit of this feature is accountability. All we're doing is removing the thought processes for the person reading your offer. Then take your list of features and benefits and decide what a single client needs as a MINIMUM to achieve a result. Ideally, these features will take you very little time to implement. These features will make up your low end package. Then add on some more features, usually features that involve time and a more personalised experience. This list will make up your CORE offer. ​Finally, add in some premium features. Features that take up the most amount of your time and would speed up the process for your clients to achieve their goals. Finally, we come to the most common roadblock when creating online training packages. How to assign a monetary value to your services. There's a pretty simple solution which we'll get to in a second, but the first thing we need to know about pricing services... is that the market decides. The market, the people you sell to, always decide on whether your prices are too low or too high. They decide with their purchasing power. Tow low and you risk being undervalued, too high and you scare most people away. If Apple created a very cheap phone, a phone that was TOO cheap, customers would assume it was of low quality and therefore sales would dip. If Apple created a new phone that was way too expensive, they might sell a few of them, but ultimately, the customers decide whether or not the product becomes a success. Coincidentally, Apple have tested the market and have obtained data to define the prices they can charge for their products. And well... we all know how Apple are doing. Use the Online Training Package Price Calculator to find some rough prices. Create 3 pricing structures for mid level package based on the results you get from the calculator (20% lower, calculated price, 20% higher. Propose these prices to a group of people and ask them what they would be willing to pay. For example, let's say you enter your data and the calculator tells you that you should charge $473.21/per month for your mid level package. ($475). Now we have $380 for your lowest price, $475 mid range and $570 for the top end price. Your feedback will help me provide the best possible service to you and other clients. ​You'll be surprised at how much people are willing to pay for your services provided you make the value clear. ​If the feedback you get is way off, you might need to make the value of your services clearer, increase prices if they're way to low, or decrease prices if they're way too high. Whatever happens, your prices are not set for life and you can readjust them later. WHAT IS THE DIFFERENCE BETWEEN CREATING PACKAGES FOR HIGH END COACHING AND LOW END MEMBERSHIPS? High end coaching services don't usually require packages because the service you provide to the client is bespoke to each client. Whereas low end memberships are set services that loosely fit the goals of many many clients. WHAT'S THE BEST PRICING MODEL FOR LOW END MEMBERSHIPS? It depends on your business model, but in general, the tiered pricing model with 3 tiers works best. This enables you to create packages specific to different goals and budgets. WHAT'S THE DIFFERENCE BETWEEN FEATURES AND BENEFITS? Features are factual statements. Benefits are results. To turn a feature in to a benefit, ask yourself, "what's in it for the client?". What does the client achieve from using the feature.